Hi, I’m the animator and co-designer of Slap City, and today I want to talk about the ideas and philosophies that go into making the game. 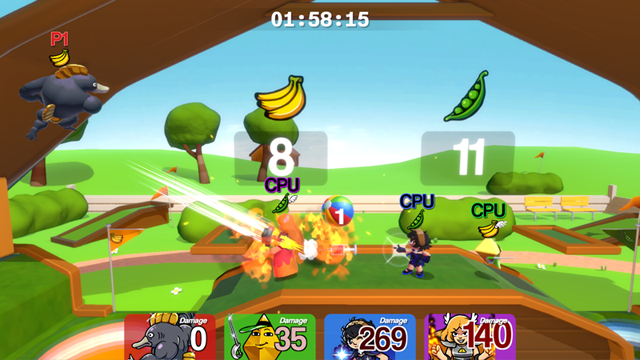 Slap City is mainly designed to be fun and silly, but it should preferably also hold up when played competitively, even if not to the degree that serious competitive-only games do. Like most of our games, we’re only six people developing it, so we stick to this whimsical and self-indulgent approach to the art style and characters and hope that others will like them as well. 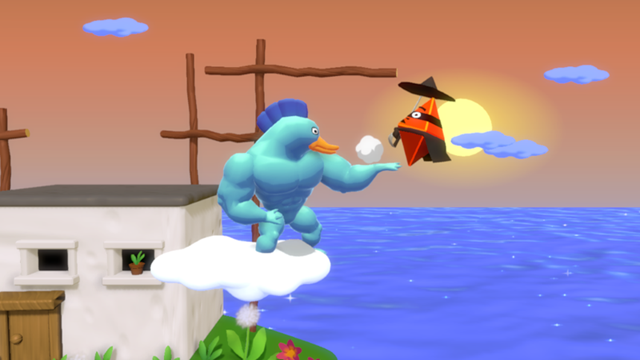 The heart of Slap City is the fluid character movement. Any ground move can be performed while standing, walking, running or turning, and instead of the “L cancelling” from the first two Smash Bros. games, we have Dash cancelling which gives your character a burst of directional speed if you press the Block button while landing. Meanwhile the Clutch button can instantly reverse the facing and momentum of certain moves, as well as doing a bunch of other things that help the player perform most “analog” inputs with a digital controller or a keyboard. Like the individual tricks that each character has, the idea is that the more options the player has, the more exciting it can get, but they shouldn’t need to use all of them (and newcomers should be able to have fun without discovering them). -Buff weak or underused moves so they become useful. -Chaingrabs and moves that combo easily and infinitely into themselves are no fun. These are “nerfed to make the game buffer”, as project lead Elias puts it. If there’s an infinite somewhere, we just missed it. -After the patch that nerfed Ultra Fishbunjin in ten different ways at once (I’m sorry! ), and that time I messed up Jenny Fox’s axes and skateboard (I’m sorry!) I try to only nerf one move per character per patch at most, while buffs are free. Sometimes we may still feel the need to change multiple things at once, but if the change isn’t well received, we try to come up with something better. 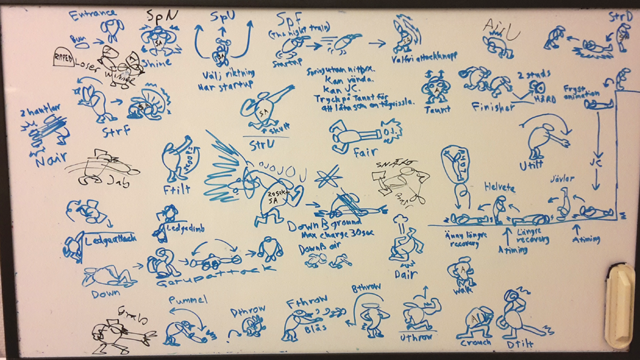 Our design process for each character is to draw all the moves on a whiteboard until we get tired, and then keep going anyway, at which point you get things like Fishbunjin’s “trust fall” triple Down strong, and the Goddess of Explosions breathing fire or punching bouncing projectiles around. It wouldn’t be Ludosity if the game wasn’t ridiculous. We have plans to turn the Free-For-All mode into something where points are scored by doing all sorts of things besides KO’s, including some form of items or modifiers you can earn mid-match. So please stay tuned for that. When it comes to the “Library”, previously known as the “Gallery”, there’s a lot we’d like to put there in the future. 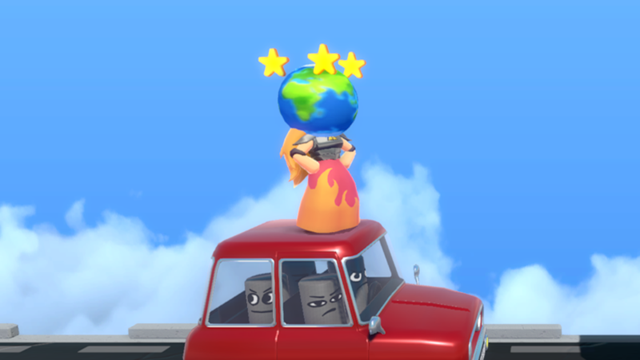 The player is meant to unlock additional pages by finding secrets in the upcoming Story mode – some with silly lore about the world and its characters, and some with information on hidden moves and other tricks. I also want to hold off on updating the little video tutorials until the characters have stabilized more. Oh yeah, the stages! We try to have a mix of wild and competitive stages, and since the standard Slapball stage is very basic, future Slapball stages may get even crazier than Soccer field and Golf. It’s no fun if KO’s or Slapball goals depend too much on stage hazards, of course, but variety is always nice. And if you haven’t tried it yet, there’s a different Smack the Crystals stage for each difficulty level which can be independently selected in the single player menu.